"A major battle broke out on Saturday between the Israeli Air Force and Syrian Air Defence Force over the occupied Golan Region, south Lebanon and the west Damascus region. During the confrontation that lasted for hours, Israeli warplanes and Syrian anti-aircraft systems traded missile fire – literally dozens of such munitions were fired – as the latter launched a general attack against ‘Iranian and regime’ bases west of Damascus. And in a major escalation, one which has the potential to escalate into all out war, at the beginning of the battle, a Syrian surface-to-air missile downed an Israeli F-16 fighter jet over the occupied Golan Heights (described as ‘northern Israel’ by Israeli sources)." Strategic postures of Israel, Syria, Russia, Iran and Hezbollah (2/8/18, before this action began). The area Northeast of the Euphrates river in Syria is where Syria's best oil wells lie. The US has attacked Syrian government troops there and killed around 100, to prevent them from retaking Syrian oil. It looks like American artillery and airstrikes killed some Russians, too. This is more open and illegal war against Syria, by the US, on behalf of... "Your freedom" and stuff. Caitlin Johnstone: " Believe it or not, it appears very likely that the US military’s latest act of butchery waged upon Middle Easterners on their own land was not about self-defense at all, but about oil." Lebanon's offshore gas and oilfields, which Israel intends to prevent Lebanon from accessing ("My Preciousss") may be developed in Joint Russian-Lebanese venture. Al Jazeera sent a mole to Washington DC to infiltrate the Israeli lobby and get some audio and video. This went well, similarly to a prior project in London. There is now a Qatari documentary about the AIPAC control of Washington DC. Informal negotiations between Alan Dershowitz and friends, and the Emir of Qatar, worried about war upon his regime from Saudi/Israeli coalition, have been interpreted favorably by AIPAC lobby as blocking release of the documentary. Latest word from Qatar confounds that, but does not say when it will air. 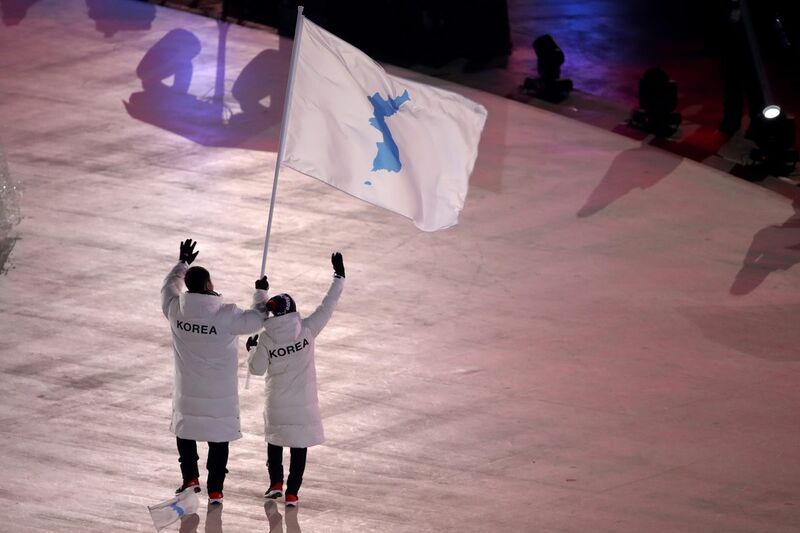 Kim Jong Un sends his sister to Korean winter Olympics as an emissary. Undiplomatic diplomats call names. Sister Kim Yo Jong gives South Korean President Moon a nice letter inviting him to talks in North Korea, at his convenience. Douglas Wilson writes about the big issue with the FISA memo, and other related memos, now, is the pervasiveness of the "so what? It's nothing" response, which means the actual totality of the corruption needs to sink in. The totality of corruption is the message. The actual governance is through the deep state and almost all the politicians in full cooperation. Thanks Eleni. Colorfully written, as well. Cancel Student Debt for the good of all of us. Here is a good description of how volatility investment "products", being traded rationally and professionally, created a 3PM market volatility event that went into full collapse after hours, and is not over yet. It is pointed out that this was the little problem that was certain to happen soon. There are much bigger ones, involving all of the big banks and financial firms. David Stockman is not actually taking a pot shot at Janet Yellen here (though he does), but examining the last 30 years of fed financial policy and it's direct and indirect consequences, including the actual gutting of the real economy. That is toward the end. Real investment went away about a decade ago. Yeah, you noticed too? OK, this really is Stockman attacking Yellen, as the easy-money-heroin-dealer that got America (hey, the world!) hooked, but not sparing Bernanke and Greenspan, either. It is still factual and informative as to mechanisms.